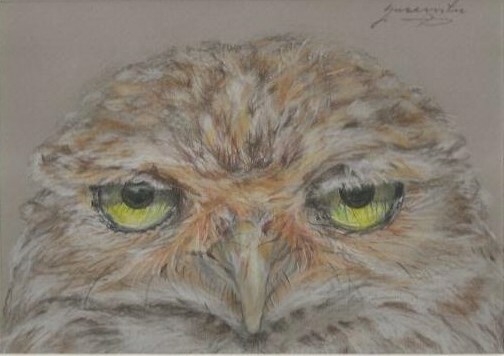 This softly rendered little guy is drawn with pencil crayon on coloured paper. 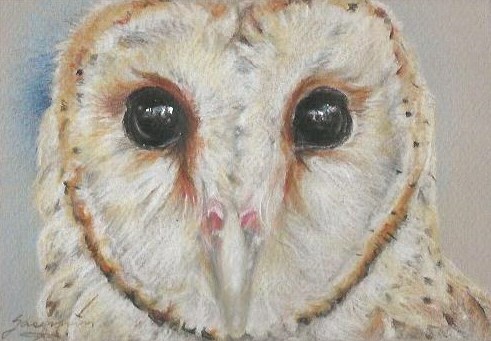 He/she is the first in a series of owls that I am working on. With at least a handful more to follow. Stay tuned for the others. The dark and menacing coloured pencil owl as he stares off at…? A close-up of the large, amber-eyed, whispy eared little owl. He was rendered with pencil crayon on coloured paper. This pencil coloured fella is a on a dark background but still somehow seems light, surprised, maybe even dumbstruck? This owl looks to me to be smiling. It was completed with pencil crayons on coloured paper. Reference photo credit to Zoosnow on PB. Pencil Crayon on Black Paper. This reference photo for this drawing is courtesy of “kapa65” on Pixabay.